Hit the Hardware Store for Carseat Toting Needs! We recently took a vacation and after some debate decided it was safer to bring our own carseat rather than rent one of dubious quality along with our car. You can buy special carts to transport car seats, but a friend of ours filled us in on a much cheaper and more versatile tip: a hand truck! I picked up this simple folding hand truck from Home Depot, along with two heavy duty bungee cords. 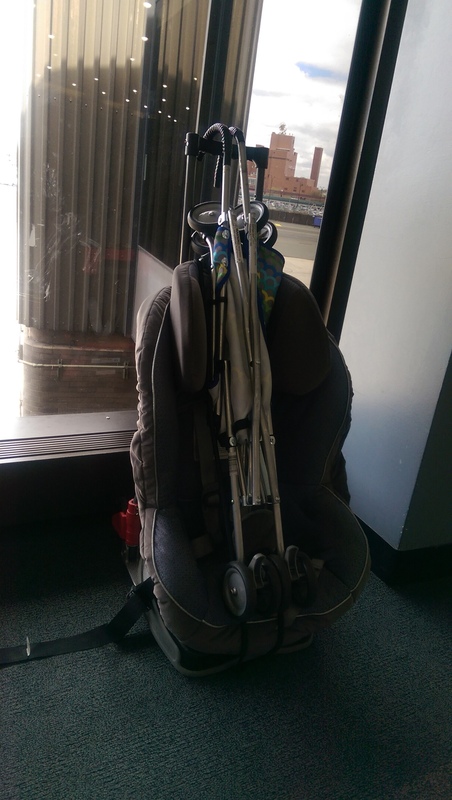 All it took was setting our carseat to its fully upright position, hooking the cords over the top and around the bottom, and we had a good solid unit that was easy to tug around the airport. When it came time to board the plane, we were actually able to fit the hand truck in the overhead bin and strap the carseat into the airplane seat. 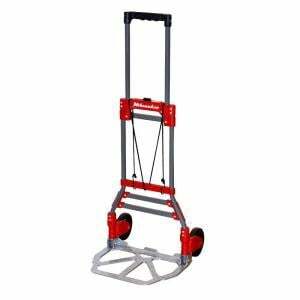 Best of all, the hand truck is made extremely well. It rolled smoothly, felt very solid, and could be used one-handed with the carseat and an umbrella stroller on it. Once it’s collapsed it’s just about two feet long, easy to toss in a trunk or in an overhead bin. We will definitely get use out of it as a hand truck around the house, and we’re all set for the next time we travel! Here’s the part that really makes this an attractive option: a similar carseat specific hand truck will run you between $70-100, even on Amazon! Granted, these types of trucks will also double as a “stroller” in that you can safely strap your child into them, but it’s up to you if that is worth the cost. We knew we needed something to make travel easier, and we were able to find a hand truck for $25 (it’s currently $29.99 on Home Depot’s site). We already owned the umbrella stroller, but even if we’d purchased it for the flight it was only $15, and we used it while out and about as well as at the airport. So at most, buying a generic hand truck and simple stroller costs you around $40, which leaves you plenty of extra money for souvenirs (or a stiff drink from traveling with a toddler) on your trip!